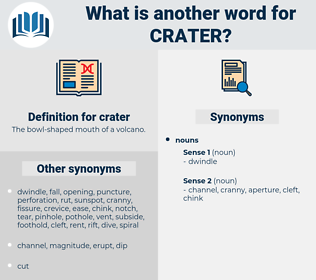 What is another word for crater? The bowl- shaped mouth of a volcano. ascend, cook, burgeon, wax, thrive, triumph, spike, expand, mount, increase, soar, intensify, accumulate, swell, deliver, prevail, rise, lift, mushroom, grow, snowball, arise, enlarge, flourish, win, up, prosper, go, balloon, escalate, build. As this only rises four hundred feet above the older containing crater, it is not always identified from below as the highest point. There's a crater in there. 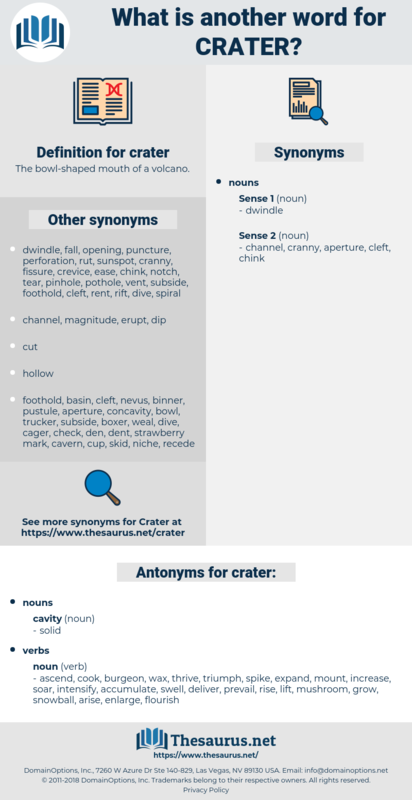 cherry tree, courtier, corduroy, corridor, curator, creditor, car door, creator, carter, checkered adder, cartier, chokecherry tree, cortaderia, charioteer, creature, certiorari, credit hour, car tire, critter, charadrii, charter, charity throw. caldera, maar, lunar crater, collector. depression, natural depression, geological formation, formation.